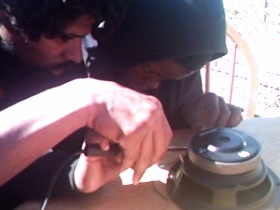 Founded in 2011, The Bayview BOOM pilot-program introduced at-risk teens to electronics assembly, woodworking, metalworking, and product design. Our apprentices are at-risk for truancy, dangerous drugs, criminal activity, violence, guns, and prison. We emphasize girls in engineering. We're preparing to teach teen apprentices how to build and market a real hardware product. We empower our apprentices with the skills and hands-on experience to build a brighter future for themselves. The BOOM plants seeds for mastery and invention.